The scoreboard hit all zeroes at Arrowhead Stadium and yet another loss was added to the Denver Broncos’ 2017 season, as the Kansas City Chiefs took down the Broncos 29-19. With the loss to the division-leading Chiefs, the Broncos fall to 3-4 on the season. The Broncos didn’t allow Kansas City’s two electric playmakers to beat them though. Denver dug their own grave, committing five turnovers (three interceptions and two lost fumbles). 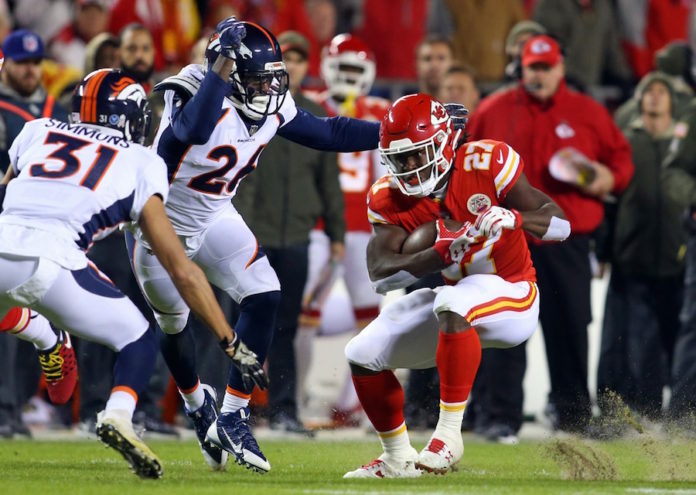 Despite the five turnovers, the Broncos were within one possession of the Chiefs’ lead due to a tremendous effort on defense – especially in containing KC’s dynamic young playmakers, Kareem Hunt and Tyreek Hill. Leading the team with eight total tackles (seven solo, one assist) inside linebacker Brandon Marshall had himself one of the better games of his career, as he led the Broncos’ defense that held the star rookie running back Hunt to only 46 yards on 22 carries. 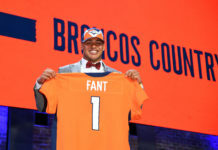 Hunt, also used as a dynamic receiver out of the backfield, was held in check in the passing game as well with Marshall tasked with covering Hunt out of the backfield. It was the first time in his NFL career (now eight games) that Hunt was held below 100 yards from scrimmage. He ended the game with 46 rushing yards and 22 receiving yards. While Marshall had himself a solid day against Hunt, the rest of the defense also stepped up big in terms of improving on their top-5 ranked run defense. The entire defense seemed intent on stopping the Chiefs’ running game, as 14 different players recorded a tackle on defense. Often referred to as the fastest player in the NFL, Hill had a quiet game against the Broncos on offense and had little impact on the Chiefs’ win overall. The lightning-fast receiver was held to only 38 yards on two catches as the “No Fly Zone” stepped up to the challenge of stopping the dynamic playmaker. Throughout the game, the trio of Aqib Talib, Chris Harris Jr. and Bradley Roby rotated covering Hill. 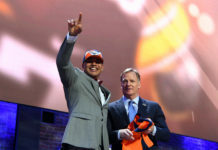 After scoring four touchdowns in two games against Denver last year, Hill was unable to find any other offensive production – evidenced by the Broncos defense forcing Hill to toss his first career interception. Late in the first quarter, the Chiefs attempted a trick play designed for Hill to run a fake sweep and throw the ball into the end zone. Staying disciplined and not falling for the bait, the play ended in Hill throwing an interception into the waiting arms of safety Darian Stewart. After that play, Hill registered just one catch. It’s been a frustrating season for the Broncos, who started the season at 3-1 with a lot of promise led by a fresh offense. Throughout all of the struggles as a team, the Broncos’ defense has played admirably, keeping the Broncos in most games despite the lack of production on offense and numerous turnovers that have allowed opposing offenses to start drives with premiere field position. At 3-4, the Broncos will travel to Philadelphia next week to take on the Eagles, concluding a stretch of three-games on the road. With uncertainty at quarterback, poor offensive line play and an inability to consistently score points, tremendous defensive efforts like stopping Hill and Hunt are going to waste.